Incredible views and convenience to everything from this centrally located, comfortable condo. 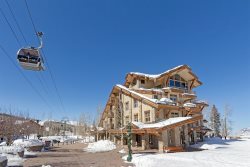 Pine Street C is a 3 bedroom, 2.5 bathroom condo in a great location-just a short walk to the base of the Gondola/Lift 8 and to everything that Main Street has to offer. The deck offers great views of the surrounding area and mountains. This condo is great for families or groups, and is a perfect option year-round. **Please note this property is located adjacent to a popular restaurant in downtown Telluride. The property is in an EXCELLENT location. The bed linens, couches and chairs were top notch. Even though the space looked small, it actually held 5 people extremely well. The condo at 225 South Pine unit C was very spacious and nice. Very Ideal location in town close to skiing, many restaurants, and the liquor, grocery and other stores. Some noise from Smugglers Bar next door late at night but it was acceptable. We would stay at this condo again. We had a great time. We had a seem less experience with latitude and telluride is beautiful !! Thank you guys so much. • Damage Protection Plan: $79.00 – Protects you up to $1,500 in accidental damage, theft or lost keys to a home. By Colorado State Law, occupancy cannot exceed the maximum amount of 8 for this property at anytime.